Feta, Garlic White Cheddar and Parmesan combine for a spectacular lasagna. Garfield, the eating obsessed tabby cat, has nothin’ on me. I loves me some lasagna! This “Greek-style” lasagna combines three of my favorite cheeses: Feta, Parmesan and Tillamook Garlic White Cheddar. If you haven’t tried Tillamook’s Garlic White Cheddar then you are truly missing out on something special. It transforms plain pasta dishes into palate pleasures and is super served with dry salami and a baguette. Best place to get it? Winco. 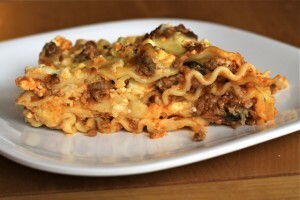 I found the inspiration for this lasagna recipe in Better Homes & Gardens. It was a $200 prize winner. I liked it “as is” but didn’t love the cinnamon. It’s now a true winner with a few ingredient changes and some much-simplified directions. 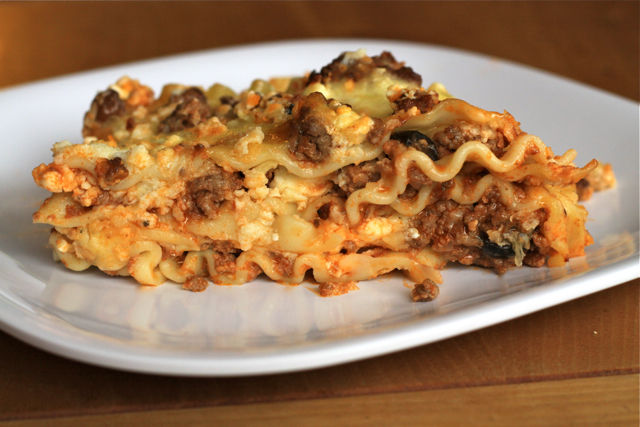 Cook lasagna noodles according to package directions; drain and rinse with cold water. Set aside. In large skillet over medium heat, thoroughly brown beef, shallot, and garlic. Drain off the fat. Add tomato sauce, wine and oregano. Reduce heat and simmer the mixture, uncovered, for approximately 10 minutes. Salt and pepper to taste. Remove from heat and mix in 1 beaten egg and sliced olives. Set aside. In a small saucepan on low heat, melt the butter. Whisk in the flour, 1/4 teaspoon ground pepper and milk. Continue to cook until sauce is heated through and begins to bubble. Remove from heat. Stir in grated Parmesan and 2 beaten eggs. In a 9×13 pan, spread 2 tablespoons cheese sauce. Layer 3 noodles, one-third of the meat sauce, one-third of the crumbled Feta and one-third of the shredded garlic cheddar. Repeat layers twice. Bake, uncovered, 35 to 40 minutes or until hot. Let stand 10 minutes.